A lot of people believe there’s a deep religious significance to the holiday we’re enjoying right now. Others argue it’s older than that: an ancient spring festival, celebrating the spring equinox, fertility and new growth. But every child knows what Easter is really all about. Yes. Chocolate. Yummy, delicious chocolate. 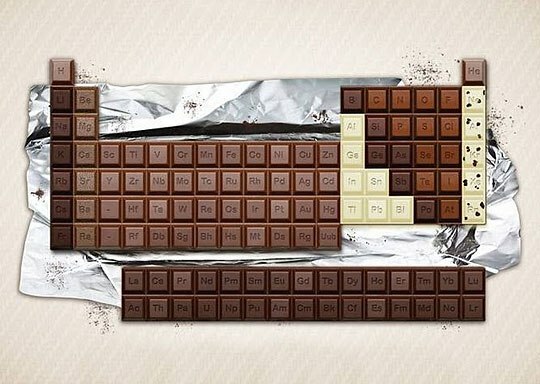 So with that in mind, let’s talk a little about the chemistry of chocolate. For it is very interesting stuff. What’s in the lovely, creamy, sweet brown stuff? And how do they get it to melt so perfectly in your mouth? And does it really give you a happy high? How do they get chocolate to melt so perfectly at body temperature? There is more to this than you might imagine. First of all you have to know something about crystals. Most people, upon hearing the word crystals, think about clear, shiny things twinkling from from Katie Price’s latest wedding dress. But in fact lots of substances form crystals, because a crystal is just a piece of any solid material that has regular shapes arranged symmetrically. Crystals don’t have to be transparent. Metals are crystalline. Pure iodine forms rather pretty grey-silver crystals. And, crucially, fat also crystallises. In fact the fat in chocolate, cocoa butter, can crystallise in many different forms. Only one of these is the lovely, hard, shiny one that is so nice and snappy at room temperature. If you’ve ever cooked with chocolate, or indeed just left it in the car on a hot day by accident, you probably know that if you melt it and then just let it solidify again the result is dull-looking and crumbly. Getting the right form of chocolate crystals to form is called tempering, and it’s a complicated business. First the chocolate has to be melted at a high enough temperature to melt all the crystals. Then it needs to be cooled to just the right temperature for the best crystals to grow, then agitated, then warmed up a tiny bit (but not too much), then cooled again. There are other methods, but this is the one that’s used in the big chocolate factories. Just ask the Oompa Loompas. What about the other question: does chocolate really give you a ‘happy high’? Well, it turns out there’s a whole cocktail of naturally-occurring bioactive chemicals (some people see ‘natural chemicals’ as a bit of an oxymoron and that’s ironic in a way, since the very brain that learned big words like oxymoron is actually stuffed full of natural chemicals that make it work) in chocolate. Firstly, caffeine, otherwise known its less tongue-tripping name of 1,3,7-trimethylxanthine, but we’ll stick to caffeine. We’re all familiar with caffeine from tea and coffee, and that drink that’s falsely advertised as giving you wings, but its presence in chocolate is sometimes forgotten. It is of course a stimulant, exciting the central nervous system (it’s very excitable), boosting heart rate and contracting muscles. It also acts on receptors in the brain and causes them to release pleasure-producing chemicals. There isn’t a lot in chocolate though: it varies by type but even in the darkest of dark chocolate, there’s generally less caffeine than you’d get from even a single cup of tea. Milk chocolate has even less and white chocolate has none at all. But there’s more of another chemical, also a stimulant: theobromine. This is interesting stuff. It’s a heart stimulant and, like caffeine, a diuretic (it makes you wee). More recently it’s use as a potential treatment for cancer tumours has been investigated. There is roughly eight times more theobromine in chocolate than caffeine, but we metabolise it quickly so it doesn’t hang around in our bodies for long. It’s less safe for animals: as any responsible dog owner will tell you, chocolate is very bad for dogs. This is mostly due to the theobromine (the caffeine isn’t great either, but there’s not so much of that). If your pooch gets into your Easter eggs, they could suffer nausea and vomiting, diarrhea, muscle tremors and, potentially, heart failure. So keep your eggs out of reach. It’s not just stimulants. Chocolate also contains fatty acids called cannabinoids. Guess what they’re similar to? The clue is in the name… yes, their cousin is called tetrahydrocannabinol, and it’s found in the cannabis plant. When cannabinoids hit the brain they make you feel relaxed and intoxicated. And that’s not all, chocolate also contains phenethylamine, sometimes dubbed ‘the love drug’ because levels increase in the body when you’re feeling romantic. Although there isn’t much and it’s metabolised too quickly to have a significant effect. So with this delicious swirly mixture of stimulants and suppressants, surely chocolate ought to be on some sort of controlled drug list? Well, no. All of these chemicals are present in relatively small amounts, and have a limited effect on the body (human bodies anyway). People who suffer chocolate cravings aren’t satisfied by just swallowing capsules that contain the relevant chemical compounds, but eating white chocolate – which contains no cocoa solids and therefore none of the psychoactive ingredients – does the trick. This suggests that the real reason we like chocolate is simply the same reason we like cream cakes: lots of sugar and fat – yummy! So now you’ve stuffed your brain full of sciencey-stuff, go ahead and stuff your mouth with lots of yummy chocolate. Happy Easter! P.S. have you noticed that it’s kem-is-try but cho-ko-late? This alliteration spoiling bit of linguistics is because the word chemistry derives from the word alchemy, which (probably, people argue over these things) comes from the ancient Egyptian name for Egypt – khem or khame, or khmi. Hence al-khmi, ‘the Egyptian art’. This entry was posted in Everyday chemistry, Food and tagged Caffeine, cannabinoids, Chocolate, chocolate crystals, cocoa butter, Easter, Easter egg, fatty acids, Food, phenethylamine, temper, theobromine, Types of chocolate by katlday. Bookmark the permalink.